Perennial Public Power District will respond to your outage call 24 hours a day, seven days a week. After normal work hours, or on weekends or holidays, we always have two line technicians on call. Outages cannot always be prevented…storms, high winds, lightning, equipment failure, tree contact, contact by animals, and vehicle accidents are among the most common causes of power outages. Widespread outages caused by wind and ice storms will take some time to repair. If needed, all District personnel will report to work any time of the day or night if the outage conditions require that kind of support. If you experience a power outage…there are a few steps to follow to speed up the restoration process. If the line is busy, keep trying because we need your information. The Dispatch Center has several incoming lines, but they can be filled quickly in the event of a large outage. When a storm moves into the area, extra personnel will usually be brought in for support. If you have tried to get in for quite some time, the outages are likely wide-spread and we’ll need your patience and some time to get your power restored. Make sure you have at least one good flashlight with fresh batteries. Have a battery operated radio ready. Keep the refrigerator and freezer door closed. Note: food will keep for several hours in a closed refrigerator, and up to two days in a freezer – provided that the door stays shut. Purchase an uninterruptible power supply (UPS) for your personal computer. A UPS will allow for the controlled shut-down of the computer without the loss of any data. Stay away from power lines…Consider any downed power line to be energized and extremely dangerous. Never go near a downed power line, and don’t let anyone else near them. Even the ground around a downed line can be energized and deadly, so stay away! 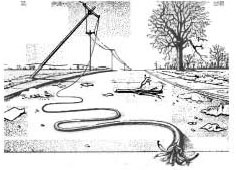 Report any downed power line as soon as possible to Perennial at (402) 362-3357 or (800) 289-0288. If you cannot reach us call your local law enforcement and give them the location of the downed line. Standby Generators…If you use a standby generator during power outages, remember that improper generator hookup can create serious problems with safety, and the operation of the generator. It is important that your service has a double-throw switch to isolate the generator from the District’s power lines. If it is not isolated, voltage from the generator could be feed back onto the District’s lines where it would endanger the lives of of line technicians working to restore your power. If the sources are not isolated, your generator could also be damaged when power is restored. The District will install a double-throw switch at the meter socket for you for a nominal installation fee. If you are interested in a double-throw switch, contact the District during normal work hours at (402) 362-3355, or email us. After a major storm that knocks down poles and wires, there are certain steps that Perennial must take to restore power in the most efficient way possible. The following graphic is generic and refers to “cooperatives” instead of Perennial, but the basic steps are the same. View The Steps to Restoring Power.